- Previous "Threats" Web Page covering the land south of the A2 in Lynsted with Kingsdown Parish can be reviewed here. Kept live in case it returns to haunt us. National Planning Policy Framework (2018) An on-line copy of the revised 2012 document governing planning authorities responsibilities. Download a PDF Copy to carry with you. National Planning Policy Guidance - online Government Resource. For the first time, planning practice guidance is easily accessible, searchable. How much of your land is built on? BBC map may be of interest. Very "broad brush" tool. Bit of fun only. Department of Transport Traffic Counts for Kent. Map created by me to show which "counting points" affect the A2/AQMA5 - these (#) references are important if you are going to make sense of the huge database..or you can look at the data (including traffic types) for our stretch of the road (updated to 2017). 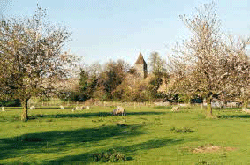 Swale Home Page for "Air Pollution"
Swale Borough Council Air Quality Management Area (AQMA) Order No.5 (Teynham) - The reference to Teynham is shorthand for the whole community on both sides of the A2. Ospringe Street AQMA LAQM Further Assessment (Jan 2013) PDF. Local Air Quality Management - Technical Guidance can be downloaded. (PDF 2.45Mb, 318 pages). Local Authorities carry out their duties under the Environment Act 1995 and subsequent Regulations. These Review and Assessments form the cornerstone of the system of Local Air Quality Management (LAQM). Kent Air Website - PDF downloads are corrupted for Teynham AQMA5. World Health Organisation (WHO) Technical Report on_Harmful_Air_Pollution (2013) PDF. Answers 24 questions on air pollution and health aspects. Kent Environment Strategy (March 2016) - PDF Download from KCC. WHO Report on Health Effects of Black Carbon (Harmful Particulates) (2012) PDF. WHO Health effects of Particulate Matter (2013) PDF. Good plain English introduction - written for Eastern Europe, but science remains the same. National Air Monitoring Service and Resource - Low detail at local level. National background figures. Links that may be of interest in meeting future threats facing our communities. Big Picture: Swale Borough Council (SBC) are obliged by Central Government to revisit their Borough Plan home-building targets - all Counties are being 'encouraged' to increase the number of planning approvals and make more land available. You do have several opportunities to share you views in consultation. Emerging Local Plan for Swale (2022-2038) - Bookmark the SBC Home Page to keep in touch with current official thinking. Public Consultation ended: 8th June 2018. To find out how to get involved, use this link to SBC "Current Consultations". To contribute, you will need to register on their Consultation Portal on this link. New Garden Communities Prospectus: An invitation for developers and landowners to put forward sites and ideas for new garden communities in Swale April 2018. SBC Prospectus download PDF. Consultation Ended: 12 midday on 3rd August 2018. This is SBC's response to Central Government pressure to make dramatic changes to the availability of land to meet local needs. It is a game-changer. ‘Call for Sites’ proforma: The Council is preparing a Brown field Land Register and widening its Strategic Land Availability Assessment beyond identifying potential housing sites, to also include sites for travellers, employment, retail, tourism, leisure or a mix of these uses. The importance of Air Quality is retained, as is "cumulative impact" policy affecting AQMAs. On-line copy of the NPPF can be found here. This replaces the 2012 version. Kent County Council, Planning Applications Committee met on 16th May 2018 to "note" the principals contained in the Draft NPPF Revision as it currently stands. Update: Swale Borough Council's response to Quinn's agents about the need for an Environmental Statement - Use this link to read SBC Letter and the opinions of the Statutory Consultation bodies. Last year, we saw a tactical withdrawal of the proposal to develop land to the south of the A2 that falls inside Lynsted with Kingsdown Parish boundary. Why "Tactical"? Developers will always step back from an outright rejection because that firmly closes the door - they will want to keep open the option to return to the idea - perhaps as part of the Local Plan Review? SBC Officials gave advanced notice of "likely rejection", knowing that their rejection would 'close down' this option for the future...... bear in mind and SBC Officials apparently encouraged the application in the first place. In short, the Lw/K Parish development is not yet entirely dead. Garden Towns. Agents working for Quinn Estates have lobbed a mega-proposal into the Planning Department that matches Central Government proposals for "Garden Towns" as a radical response to housing needs. A single approval on this scale would tie SBC's hands into the future as the developers will hold the whip-hand. Perhaps SBC will look at options for 'phasing' or 'zoning' such a massive development opportunity to retain some control over several competing developers? It is hard to see quite how this will pan out. Banking of Land. To understand how this will play out, we will need to keep an eye on whether SBC are pressing developers sufficiently to deliver developments already approved under the current Local Plan rather than "banking" the development land to realise profits on selling-on parcels of that land to other developers. Apparently this has already happened for one parcel of land in Teynham Parish! Not one house built! Planning Portal Papers. Now that Swale Borough Council have confirmed the need for this mega-development to include an Environmental Impact Assessment (EIA), we must watch and wait. The developers will have to develop detailed proposals on highways matters. KCC and Transport England will lead on whether they feel the road infrastructure can support the proposals. SBC will have to unravel the balance between housing needs and the 'harm' done to the local environment through the addition of traffic along the A2 and into the four AQMAs (Sittingbourne, Greenstreet, Ospringe). This proposal is an opening gambit from Quinns to establish themselves as front-runners in the SBC Review process for the Local Plan (2022-2038) and SBC's invitation to developers and landowners to submit ideas on land-use and wider delivery of "Garden Towns" to match Central Government rhetoric. Screening Opinion link - 17/506492/ENVSCR - Screening Opinion..
Scoping Opinion link - .17/506551/EIASCO - Scoping Opinion. DEFRA and "A Green Future"
“This 25 Year Environment Plan sets out government action to help the natural world regain and retain good health. It aims to deliver cleaner air and water in our cities and rural landscapes, protect threatened species and provide richer wildlife habitats. It calls for an approach to agriculture, forestry, land use and fishing that puts the environment first. .... we will work with the Devolved Administrations as we leave the EU to uphold environmental standards and go further to protect our shared natural heritage. We will continue to work with the Devolved Administrations on areas where common frameworks will need to be retained in the future. This Plan does not pre-empt these discussions. •	Using and managing land sustainably (chapter 1). •	Recovering nature and enhancing the beauty of landscapes (chapter 2). •	Connecting people with the environment to improve health and wellbeing (chapter 3). •	Increasing resource efficiency, and reducing pollution and waste (chapter 4). •	Securing clean, productive and biologically diverse seas and oceans (chapter 5). This makes interesting reading as background material when looking at the ideas proposed for 11,500 new homes and commercial and social sites! What price our environment and the destruction of acres of greenfields....? Swale Borough Plan "Bearing Fruits"
"So I Can Breathe" - BBC Blog Season - links with a range of associated topics. WHO chief: Air pollution link to 600,000 deaths in children. See see all the documents here - the Planning Portal page for Lynsted Lane development papers. RULE No.2: DO NOT WRITE JUST ONCE! means the 'start gun' is fired again by the SBC Planning Department. After all, if there have been changes, SBC may assume you have changed your mind if you don't react to each change. WHAT IS "IN IT" FOR SWALE BOROUGH COUNCIL? Council Tax. Each new home-owning person or family brings another contribution to Council Tax and some additional spending in the community (less if they commute out of the local community). "Job done". If the Quinn/Garden Town idea is delivered - that lets Swale Borough Council Members and Officials off the hook; meeting the central government targets .... it does not mean local construction capacity would meet the plan, nor can we be sure that all the "goodies" ("planning gains") included will be honoured. Then there is something called the "New Homes Bonus" - this is paid by central government to Swale Borough Council. Every new home brings with it a 'bonus' equal to the Council Tax paid for six years. In theory, this money goes towards all those promised 'extras' such as schools, GP surgeries, and so on. I found this article that helps make sense of whether this 'bonus' works for us or against us. Pollution - AQMA 5 establishes the fact of harmful pollution - See full assessment. The Borough Plan is building to a Review in 2022. Swale Borough Council is seeking views on their "New Garden Communities Prospectus". Major Developers preparing the way to a vast unified development that will absorb all the land between the A2 and M2 and between the A249 and Bapchild. Early days. Quinns are only asking for confirmation that they MUST submit an Environmental Statement. Follow the drift of arguments if you wish using the two duplicate links!